In a site-specific artist studio, visitors were invited to have their portrait sketched by six robots that simulated the artist Patrick Tresset’s own drawing ability and technique. These obsessive drawing machines with ‘eyes’ were linked to an artificial mind, they were also capable of displaying attention and purpose when focusing on the life-drawing participant. Resembling students, the robots drew from various view points and with different drawing styles, with their singular drawing arms limiting their freedom of gesture. 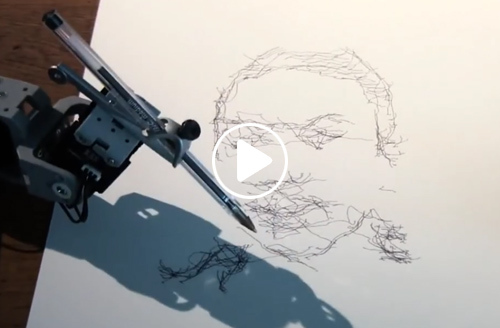 Tresset’s robots; each named Paul, are ‘obsessive drawing entities’, that can mimic the behaviour and movements of an artist engrossed in a freehand sketch. When the subject sits for Paul, its camera ‘eyes’ pan up and down as the pen in its ‘hand’ scribbles frantically on the paper in front. Each portrait taking 30-40 minutes to complete. The finished portraits were hung on the walls of the space to create an exhibition of the various people who had participated. Drawings were then included in the Collection – a series of more than 12,000 portraits of participants. The project included an event titled, The Crucible - Where Scientists Meet Artists, where The Dennis Rosen Trust and the New Scientist brought together people from both the art and science world for an evening of discussion, debate, idea sharing and networking with Patrick Tresset as the guest speaker. Commissioned and produced by Illuminate Productions for MERGE festival in partnership with Better Bankside and Tate Modern. Supported by Arts Council England, Native Land, Land Securities, New Scientist and The Dennis Rosen Memorial Trust. Awards The project went on to win The Jury Selection + The public award in the New Technology Art Award in 2014; the Jury Selection in the 19th Japan Media Art Festival 2014 and a Bronze in the Lumen Prize in 2014. Key coverage total reach 264 million. Media included: The Independent, The Telegraph, Metro, The Times, Time Out, The Evening Standard, The Guardian Critics Choice, The Daily Mail and Wired Magazine. Premiering for MERGE Bankside 2017, Human Study #4 was a commissioned robotic art installation inviting visitors to observe a classroom of 20 robot pupils being taught lessons. Each robot displayed human traits affecting their behaviour such as shyness, nerdiness, boredom and some were distracted by the activity of their colleagues or the public in the room. The theatrical classroom was inspired by Tresset’s own childhood memories and a fictional nostalgia of 1970s French primary schools. Using robots as minimal actors, Tresset revisits his interest in the representation of the human tendencies towards conformity and obsessiveness, while at the same time expressing the passing of time through mark making. Due to public demand in another room you could take the sitter’s role to be sketched by robots now observing you (as in 6 Robots Named Paul above) in a scene reminiscent of a life drawing class. The three robots (Human Study #1, 3RNP) in this installation sketched your portrait obsessively - the human participant at the mercy of the robot’s scrutiny. The exhibition coincided with the UK launch of Patrick Tresset’s new book Human Traits and the Art of Creative Machines, published by the Laznia Centre for Contemporary Art, Gdansk Poland and edited by Ryszard Kluszczyński. A talk with the editor, Patrick Tresset and art historian Francesca Franco also took place. Commissioned and Produced by Illuminate Productions Illuminate Productions for MERGE festival in partnership with Better Bankside and Tate Modern. Key coverage total reach 306 million. Media included: BBC News, BBC Click, London Live, The Independent,The Guardian, Wired Magazine, Evening Standard, Time Out, Metro, Refinery29, and The Metropolis. Patrick Tresset is a London-based artist and scientist who develops and presents theatrical installations with robotic agents as actors which are evocations of humanness. Tresset’s installations use computational systems that introduce artistic, expressive and obsessive aspects to robots’ behaviour. These systems are influenced by research into human behaviour, more specifically how artists make marks that depict, how humans perceive artworks and how humans relate to robots. Tresset develops robots and autonomous computational systems to produce series of drawings, paintings and animations. Tresset’s work has been exhibited in galleries worldwide and in association with major museums and institutions such as The Pompidou Center, Museum of Israel, Victoria & Albert Museum (London), Museum of Modern and Contemporary Art (Seoul), BOZAR (Brussels), Prada Foundation (Milan) and at events such as Ars Electronica, Update_5 and WRO2015.